The BellCommander USB Relay Controller allows most existing bell systems to use the easy-to-use and powerful scheduling capabilities of BellCommander. 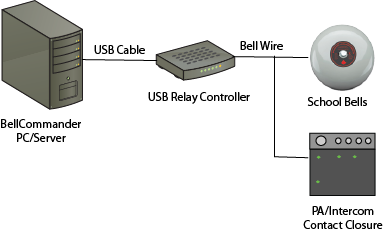 Bell systems that connect to a mechanical or electronic device for scheduling via relays or contact closures can be replaced with the USB relay controller and the BellCommander software. BellCommander supports up to 8 relays with independent schedules. For bell systems that use a different relay for each zone, BellCommander can be used to schedule audio for up to 8 zones. In addition, the BellCommander USB Relay Controller can also be connected to other devices, including sirens, factory signal lights, and more. For example, a sounder/siren, such as this model, could be used to provide both audio and visual notification of factory work breaks. This is ideal for noisy areas or in locations where hearing impaired workers are located. The BellCommander USB Relay Controller is an easy-to-use USB device as opposed to most other systems that rely on older serial port technology. With the USB Relay Controller, simply connect the controller to the BellCommander PC and it will detect the device without having to install drivers. The controller is also USB bus-powered, so no external power is required! The relays are capable of 5.0 Amps at up to 120VAC or 5.0 Amps at up to 30VDC. For more relays, contact us. If you need help determining if your system is compatible, please contact us.